Talk about sheep being led to the slaughter. The S&P 500 is up 11% from its February 11th intra-day low (1812) because Wall Street still has inventory to unload. That much is par for the course. Yet the signs of an impending macroeconomic and profits implosion are now so overwhelming that it is truly remarkable that there are any bids left in the casino at all. 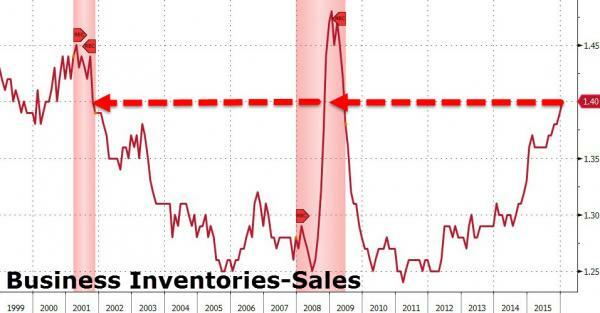 This morning’s release of business sales for January, for example, showed another down month and that the inventory-to-sales ratio for the entire economy is now at 1.40X—–a ratio last recorded in May 2009. Once upon a time, real economists, investors and traders knew that business sales, wages and profits are the heart of the matter. No longer. The self-referential sentiment surveys, financial conditions indices and bullish spin on Fed word clouds which animate today’s casino muffle the fundamentals almost entirely. Yesterday on Bloomberg TV, for example, my downbeat view was challenged with a chart showing that Goldman’s financial conditions index had perked up during the last 5-weeks. Where, I was asked, is the recession? How about the quarter century of history shown below? 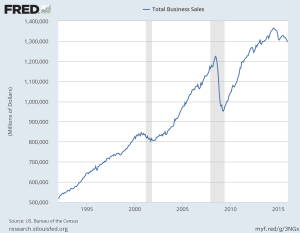 Business sales reported this morning were down by 5.1% from their July 2014 cyclical peak. Self-evidently, declines of that magnitude have occurred only twice since 1992, and both of them bear the shaded imprint of recession. The chart also bears something else. Namely, real economic meat and potatoes. Even at their slumping January level, business sales came in at a $15.5 annual trillion rate. That’s something; it measures the entire churn of manufacturing, wholesale and retail sales from coast-to-coast. It trumps monthly purchasing manager sentiment surveys—often filled out by secretaries; and also such flickering signals as short-run fluctuations in credit spreads—-always banged around by the trading herd. And by a long shot. Likewise, there is not much doubt that wages are slumping, too. And we are talking here about the actual wages paid by millions of employers who remit payroll taxes to the US Treasury. The latter reports its results daily; and its collections are self-evidently at stall speed already. 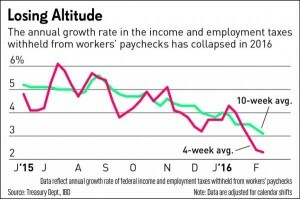 The four-week moving average is now just barely 2% above last year, meaning that after accounting for the 2% trend growth in wage inflation, there is no growth in hours worked at all. Nor is there any doubt that the trend is heading resolutely from the upper right to the lower left! Needless to say, the number of employers who send in withholding taxes for seasonally adjusted phantom employees is somewhere between zero and none. Nor does the IRS even hear from companies who might have died or could have been born. 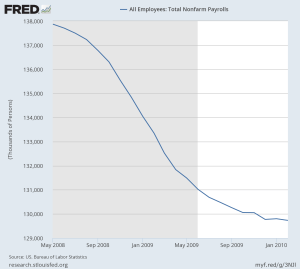 Indeed, the BLS’ clunky modeling fantasies should have been repudiated long ago by the chart below. As of May 2008, the Great Recession was already six months old, but Wall Street was still unloading its inventory. And all the while, the same talking heads who have given the all-clear sign in the last 5 weeks were on bubblevision gumming about Goldilocks, no recession in sight and stability on the jobs front. Here’s what happened next. Roughly 9 million jobs disappeared during the following 20 month. Yet it was only after the fact that the BLS job modelers caught up with the ongoing recessionary reality, and drastically adjusted downward their initial postings. That was long after declining trends in payroll tax remittances to the Uncle Sam signaled that recession had arrived. Then there is the matter of capital investment in plant, equipment and other tangible assets capable of generating future economic growth and productivity. 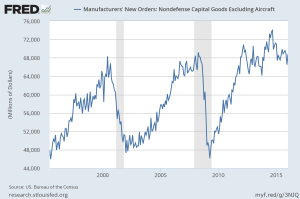 January orders for nondefense capital goods excluding the volatile aircraft category were down 7% from the year ago peak, and have, in fact, reverted to levels first reached in early 2000. There is absolutely nothing in this chart indicating “escape velocity” is at hand, and everything to suggest that the next leg is likely to unfold in a distinctly southerly direction. Moreover, the above graph is in nominal dollars and reflects the gross capital outlays planned by US companies. The fact is, the true CapEx data—-which is never mentioned on bubblevision—-is no higher than it was 18 years ago, and actually nearly 20% below the peak reached in the year 2000. 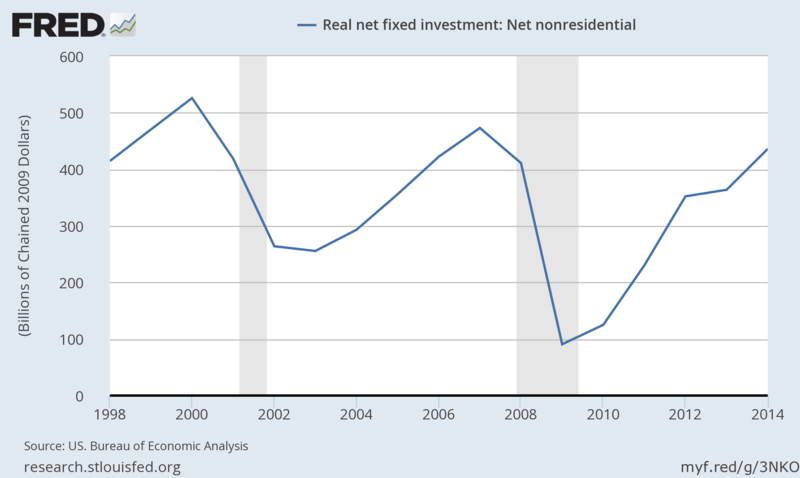 What is captured in this chart is something Keynesian spending oriented models never bother to consider. Namely, that upwards of $1.5 trillion of plant, equipment and other tangible assets are consumed each year in the process of production, meaning that until it is replaced out of gross CapEx the output capacity of the US economy is actually shrinking. But when it comes to obfuscation, nothing can match Wall Street’s corruption and deformation of the data like its treatment of corporate profits. And as the great 1920’s economists, Benjamin Anderson, always said profits are the heart of the business outlook. Needless to say, the current outlook is not good at all. With virtually 100% of the S&P 500 companies now having reported Q4 results, there can be no doubt that profits are heading south with some considerable haste. 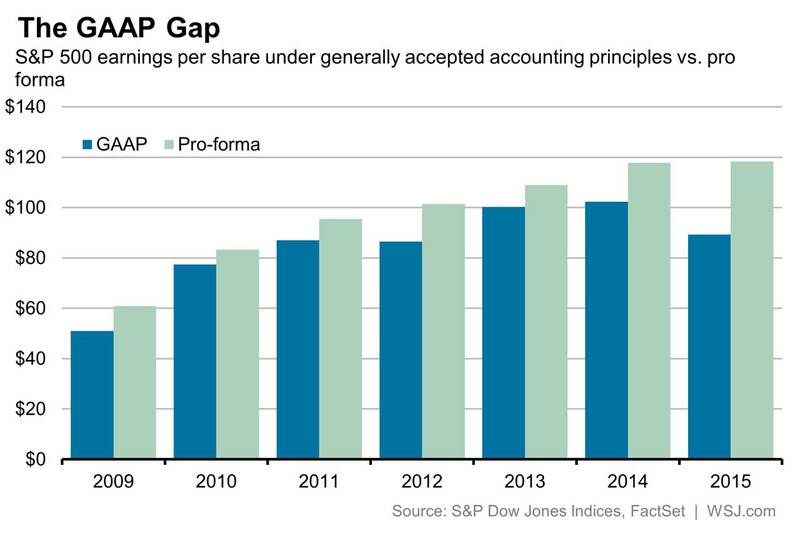 On a GAAP basis, 2015 full year profits came in at $86.44 per share. That reflected a 5% sequential decline from the LTM rate for Q3 2015, and an18.5% decline from the cycle peak of $106 per share registered for the LTM period ended in September 2014. So here is what we have. The casino closed today at 23.5X its actual current earnings, and those earnings are now going down for the count. Moreover, that limpid profit level for the S&P 500 is enormously flattered by more than $2 trillion of stock buybacks since 2009, meaning that the share count has declined by upwards of 15%. Still, profits for the LTM period just ended are up by only a hairline since the prior peak in June 2007. In fact, when reported S&P 500 earnings peaked at $84.92 per share in June 2007 (LTM basis), they had grown at a 6.8% annualized rate since the prior peak of about $54/share in Q3 2000. By contrast, at the reported $86.46 level for the LTM period ending in Q4 2015, the implied 8-year growth rate is…….well, nothing at all unless you prefer two digit precision. In that case, the CAGR is 0.22%. That’s right. Based on the kind of real corporate earnings that CEOs and CFOs must certify on penalty of jail time, S&P 500 profits have now nearly reverted to their level at the time when the first fractures of the great financial crisis appeared in mid-2007. That’s when the Bear Stearns mortgage funds went under and Countrywide Financial was rescued by its ill-fated purchase by Bank of America. So once again profits are heading down the slippery slope traced twice already during this era of central bank bubble finance. You would never know this, of course, because Wall Street has carried the adjusted profits or ex-items game and forward hockey sticks to such an extreme that honest information about corporate profits has essentially been banished from the casino. Supposedly, the $253 billion difference indicated for 2015 in the chart above dudn’t count for nothin’ when it comes to valuing stocks. After all, what do the principal non-recurring items——asset write-offs, plant shutdowns, store closing costs, goodwill reductions, restructuring charges and stock options costs——have to do with Wall Street’s authoritative EPS hockey sticks? The latter always and everywhere trend from the lower left to the upper right of the charts. And that’s because, apparently, by the lights of Wall Street, central banks always have your back. 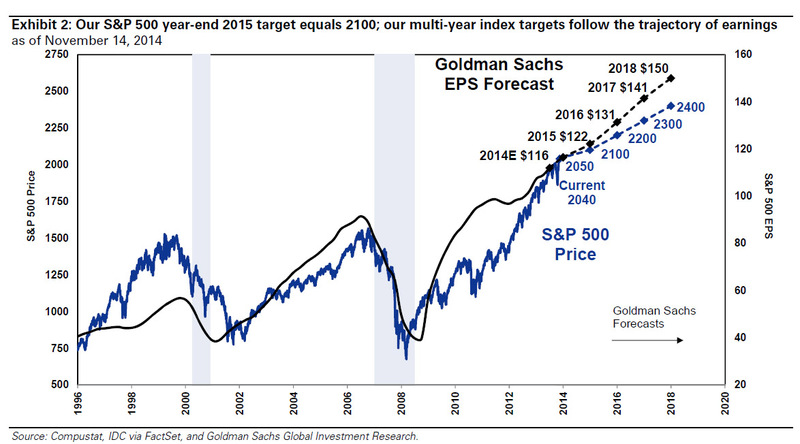 Indeed, the yawning $253 billion gap between reported earnings and the Wall Street ex-items concoction for 2015 is nearly the same magnitude as the disconnect in the Great Recession cycle. Thus, S&P 500 aggregate net income on an ex-items basis for 2007 was $730 billion—so the sell side pitchmen had no problem insisting that the stock market was “reasonably” priced. During 2007 the S&P’s average capitalization was about $13 trillion, implying an 18X PE multiple. Expressed in aggregate terms, the latter means that S&P profits plunged to$132 billion during 2008 after companies took a staggering $304 billion in write-downs for assets which were dramatically overvalued and business operations which had become hopelessly unprofitable. In short, during those two years alone—when the business and financial cycle was heading sharply southward—–the S&P 500 companies took nearly$450 billion in charges and losses that the Wall Street stock peddlers said to ignore. That amounted to full 37% of purported ex-items earnings for 2007-2008 combined. Stated differently, the market is supposed to be a forward discounting agency. Yet at the peak in October 2007 at a time when the subprime and credit markets were visibly fracturing, the index was being valued at $13 trillion based on the goldilocks theory then prevalent on Wall Street. If that sounds like history repeating itself, it most sure is. The coming recession will again obliterate the sell side hockey sticks, which this time started last spring at $135 per share for 2016 and are already being reduced at a lickety-split rate not seen since the fall of 2008. But this time there is one thing that decisively different, and it will make all the difference in the world. 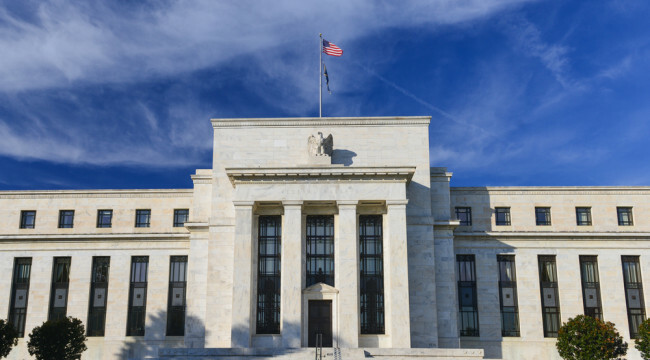 As will be reinforced once again by the post-meeting contretemps on Wednesday, the Fed has painted itself into a deathly corner and is utterly out of dry powder. It has nothing left but to hint at the prospect of negative interest rates. And that will be usher in its thundering demise. There is a new political sheriff in town on the verge of winning the GOP nomination. Even the hint of NIRP—–that is, of Washington criminally confiscating the savings of millions of savers and retirees—-would surely elicit from The Donald a resounding reprise of Clint Eastwood’s immortal injunction—-make my day! So this time there will be no Fed rescue. When it becomes undeniable that the economy is in recession and that the Fed is utterly out of dry powder panic will envelope the casino. And when it becomes further evident that no quick, artificial reflation of financial assets is in the cards like occurred after March 2009, the Big Flush will finally come.